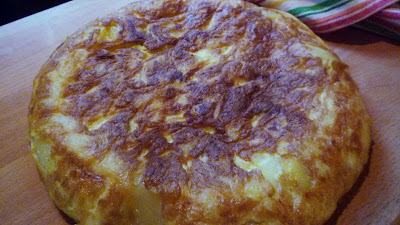 I have heard that Tortilla Española is often called the national dish of Spain. I don't know if this is true (there are other contenders for this title), but certainly it is one of the most commonly featured items on any good tapas menu. Because it is a classic...and because tapas restaurants have become so popular here in the U.S....I have assumed that there couldn't possibly be a need to post yet another recipe for this particular dish. But recently, while dining at local tapas restaurant, I was dismayed to be served a rather indifferent Tortilla Española. Apparently it is not the case that everyone knows how to make this simple and classic dish. And it is a simple dish...nothing more than olive oil poached potatoes and eggs...but, when made properly and carefully, it is (as trite as it may sound) truly greater than the sum of its parts. It is always a pleasure to make it and then serve it in a class. 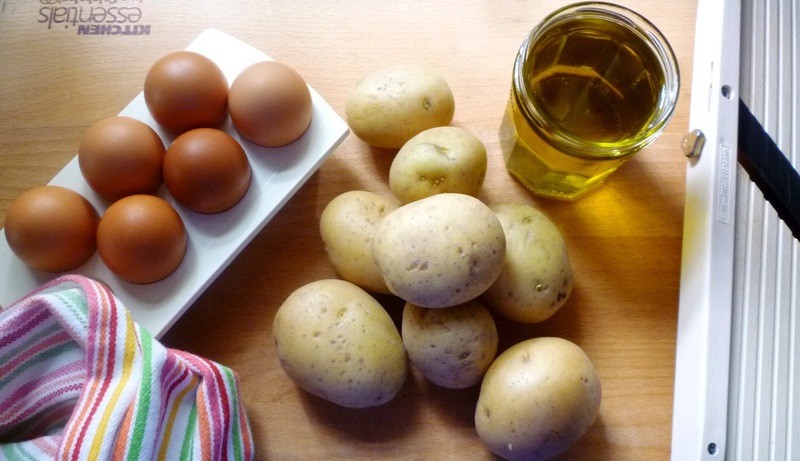 People are expecting to eat a boring dish of potatoes and eggs and their eyes light up as they sample the cake of tender olive oil infused potatoes and eggs that have somehow morphed into a delicious unified "other" via the cooking process. 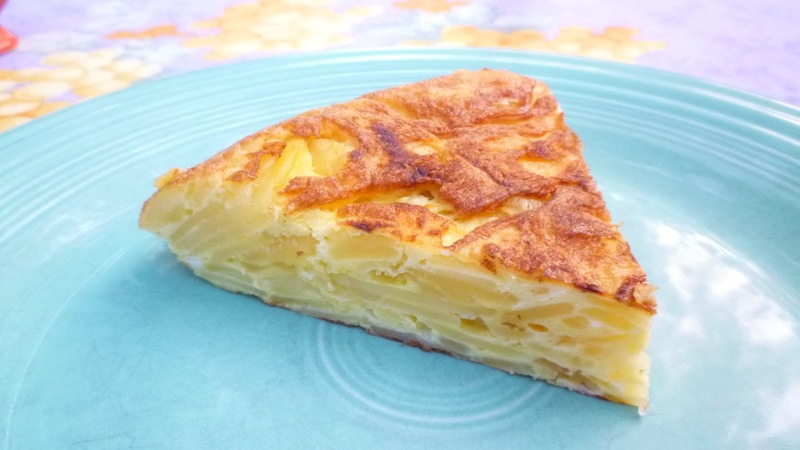 For those who have never experienced...or heard of...a Tortilla Española (sometimes called Tortilla de Patatas) you might be wondering about the name—thinking of a flatbread instead of an egg dish. 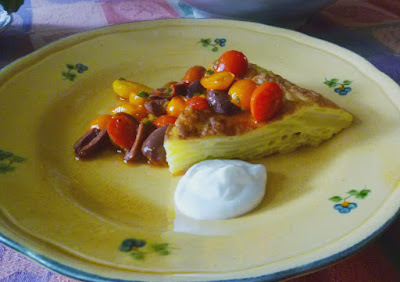 That it is called a Tortilla has to do with the fact that it is flat cake. It is occasionally referred to as a Spanish omelet, and it does in fact look very much like the Italian version of a flat omelet...the frittata. But, it is not just a potato frittata. Two things distinguish it from a potato frittata. The first...and most important...is that (as I have already noted) the potatoes are poached in olive oil. You might not think that this would make such a difference...but it does. Not only are the potatoes meltingly tender after being cooked in the oil, they are infused with the flavor of olive oil. The finished omelet has an entirely different taste and texture than one made with potatoes that have been poached in water...or roasted in the oven. The second thing is probably open to debate, but when I think of a frittata, I think first of the eggs...then of the "filling". 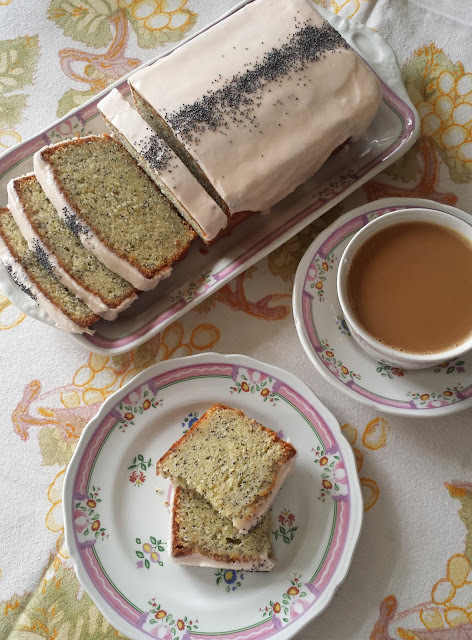 The eggs are prominent and they have a definite presence—one that stands up to...and compliments....the flavors and textures of the filling ingredients. With a frittata there should be a higher ratio of egg to filling than one would find in a Spanish tortilla. The egg functions more like a binder in the tortilla. It is a delicious binder, to be sure...but it is really not the main event. When you look at a cross-section of the finished tortilla, it should look like a tightly packed mosaic of the filling ingredients. 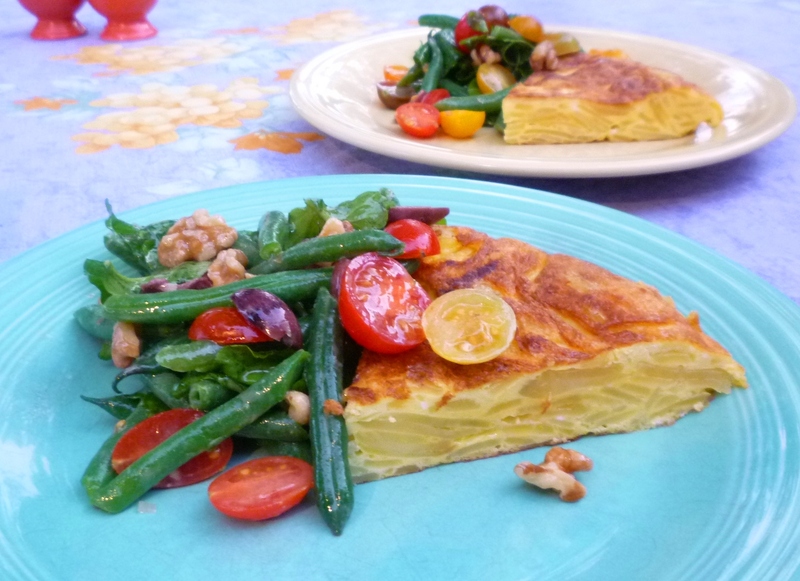 Longtime readers may recall that I have posted a couple of variations on the Spanish tortilla in the past...one with potatoes and mushrooms, and the other with potatoes and kale. (I have also posted a potato and artichoke frittata if anyone wants to compare and contrast....) In both of my tortilla variations I diced the potatoes before poaching them in the olive oil. 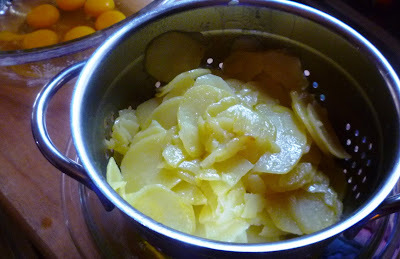 But dicing them is not, in my experience, the way the potatoes are cut for the classic Tortilla de Patatas. Rather, the potatoes are very thinly sliced. When made with sliced potatoes the tortilla requires more time and careful observation during the cooking process, but the beautiful, layered result is totally worth it. As far as details of preparation go, there are several things to keep in mind as you work. First, use a non-stick pan. I prefer French steel, slope-sided fry pans, but a traditional slope-sided American non-stick will work too. Next, when cooking the potatoes in the oil, remember that you are poaching them...not frying them (they shouldn't brown). The oil should quietly simmer....not rapidly boil. And, make sure that when you are done poaching that the potatoes are cooked through. It is even okay if some of the slices begin to break up. You don't want potato soup...but on the other hand, the potatoes will not cook any further in the egg mixture. If they are crunchy when stirred into the eggs, they will be crunchy in the finished tortilla. While on the subject of potatoes: I find that I prefer a starchy potato for my tortilla. Idaho (Russet) potatoes work well...but Yukon Golds are even better. 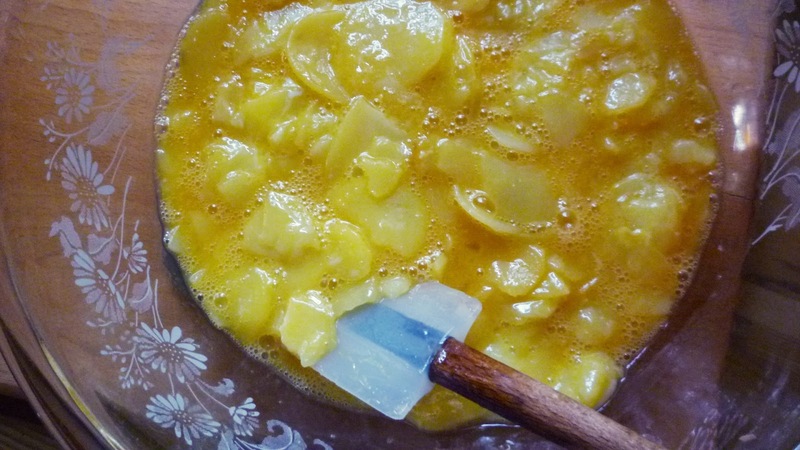 According to Anya von Bremzen (author of The New Spanish Table), the traditional potato used in Spain is the slightly less starchy, all-purpose Kennebec. 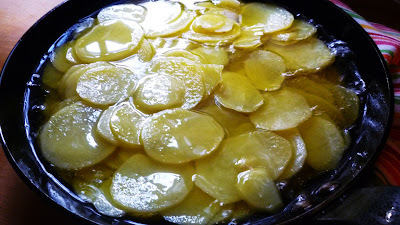 The potatoes should be sliced right before they are added to the oil, and they should never be rinsed. Rinsing will wash away the starch and it will also create a splattering mess when the water clinging to the potatoes goes into the hot oil. As for the eggs, they should be farm fresh. When there are so few ingredients in a dish, each should be of the highest quality. The eggs should also be at a warm room temperature. I have taken to submerging the eggs (in the shell) in a bowl of warm water to warm them until they are a bit above room temperature. This step seems to help the tortilla cook more quickly and evenly. When you are ready to cook the tortilla, make sure that there is no trace of potato (from the poaching process) left stuck to the pan. If there is any, the tortilla might stick...resulting in a less than beautiful tortilla (not to mention a few bad words...). A further strategy to avoid the possibility of the tortilla sticking is making sure that the pan and oil are nice and hot. 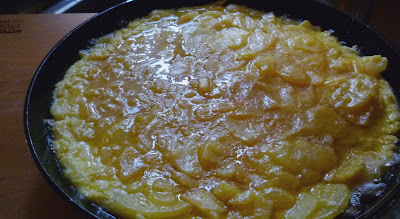 After the potatoes and eggs have been added and arranged, the heat will be turned down so the eggs won't burn...but the initial heat is important since it will immediately cook and seal the bottom surface of the tortilla. If you gently shake the pan back and forth a time or two, a thin layer of oil will slide underneath this sealed surface, which will in turn guard against sticking and burning. Be aware that when you flip the tortilla, there will still be a fair amount of liquid egg in the very center, and until you get the hang of it, the process can be a bit messy. To flip it as neatly as possible, make sure you choose a plate that extends beyond the edges of the pan. Then, clamp down hard on the plate with one hand while using the other hand, choked up on the handle of the frying pan (hold the handle with a thick towel...or a hot pad), to quickly invert the pan and the plate. When you slide the tortilla back into the pan (which should once again be hot and filmed with oil), use a heatproof spatula to help keep all the loose potatoes and liquid egg tucked under the cooked/solid portion of the tortilla as it goes back into the skillet. You will need to tuck the edges in a bit with the spatula...and possibly manipulate the surface with your fingers or the spatula...to make sure that the tortilla is once again neat, level and of an even thickness. To serve the Tortilla Española as a tapa, it may be cut in thin wedges or small squares. It is best when garnished simply...with a dollop of sour cream or crème fraiche...and maybe a sprinkling of minced chives. At my house we love to eat it for a light dinner (cut in four to six fat wedges) with a small salad of some kind. Recently I served it with a simple salad of the end-of-the-season green beans and cherry tomatoes (very similar to one I posted a few years ago...with the addition of a handful of arugula and a few toasted walnuts). I had the leftovers (it makes a delicious leftover) for lunch with a compote of warmed cherry tomatoes and olives. 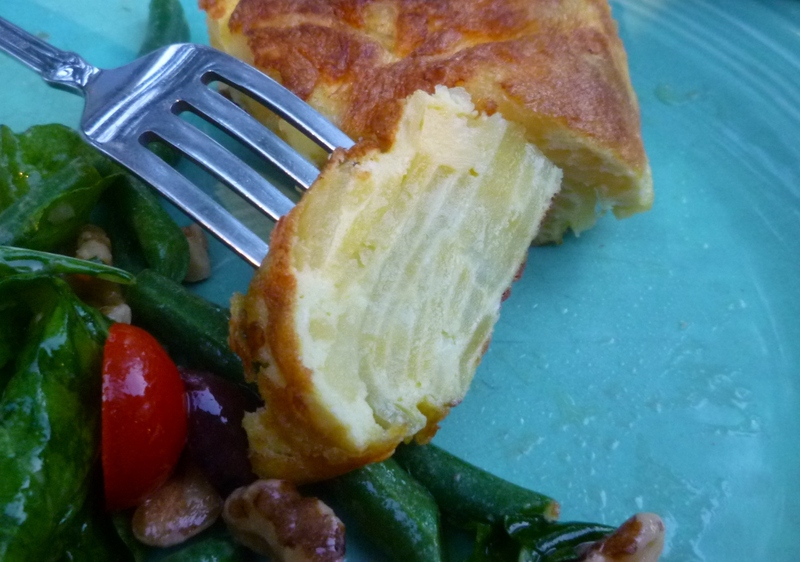 Whatever you choose to serve with your tortilla, make sure it is simple...and not too fussy... A Tortilla Española is so delicious, you will most definitely want it to be the star of the show. In a non-stick (I prefer French steel) 10-inch slope-sided frying pan, heat the olive oil over moderately high heat until hot. 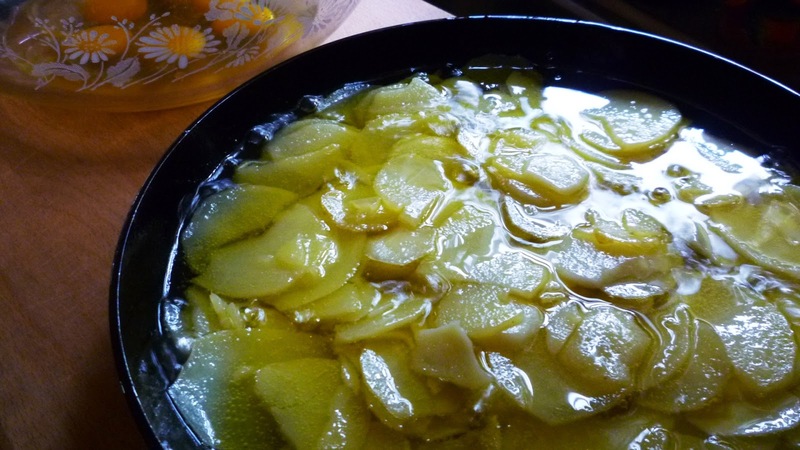 Add the potatoes, reduce the heat to medium-low and cook (the oil should maintain a gentle simmer), lifting and turning occasionally with a spatula, until the potatoes are tender and cooked through—they should not brown. This will take approximately 12 to 15 minutes. Transfer the potatoes to a colander set in a bowl and let drain. In a large bowl, beat the eggs until slightly foamy. Add salt to taste (I use kosher salt and I think 1 1/4 to 1 1/2 t. is about right) & a few grindings of pepper. Add the hot potatoes and stir gently to combine. Wipe the skillet clean and return to medium-high heat. Add enough of the drained oil to generously coat the bottom of the pan—about 2 T. When the oil is very hot (but not smoking), pour the potato mixture into the skillet, spreading the potatoes evenly. After a few seconds (when you can see that the eggs have begun to set around the edges), reduce the heat to low and cook, shaking the pan occasionally and running a spatula around the edge of the pan to make sure the omelet is not sticking. When the bottom and sides are firmly set (and the top does not appear to be too liquid)—after 7 or 8 minutes—flip the omelet. Invert a large round plate over the skillet. Hold the plate firmly with one hand and turn the skillet over using the other. If the pan seems dry, add some of the reserved oil to the pan; increase the heat. When the oil is hot, slide the tortilla back into the pan (cooked side up), reduce the heat, and cook until the omelet is cooked through—about 3 to 5 minutes more. The goal is a thick soft cake that is a pale golden color on both sides. Transfer to a platter. Serve in wedges or small squares—hot or at room temperature. Serves 10 to 12 for tapas, or 4 to 6 as a light entrée. Note: The drained oil may be strained and stored in the refrigerator for use in future omelets...or other cooking purposes. Thanks for this recipe! When you say a 10 inch frying pan, is that the interior or exterior dimension? The pan I have is 12.6" exterior diameter and 10.2" interior diameter. I am wondering if a smaller pan would be better? Thanks for asking this question. I think it's a confusing issue. My pan has an exterior measure of just over 10 inches (I think the manufacturer lists it as 10.2-inch frypan) and an interior of about 7.25 inches. So you would need a smaller pan (or you could make a bigger tortilla!). Typically, I think pans are listed by their exterior/rim-to-rim measurement. I hope you enjoy the tortilla!